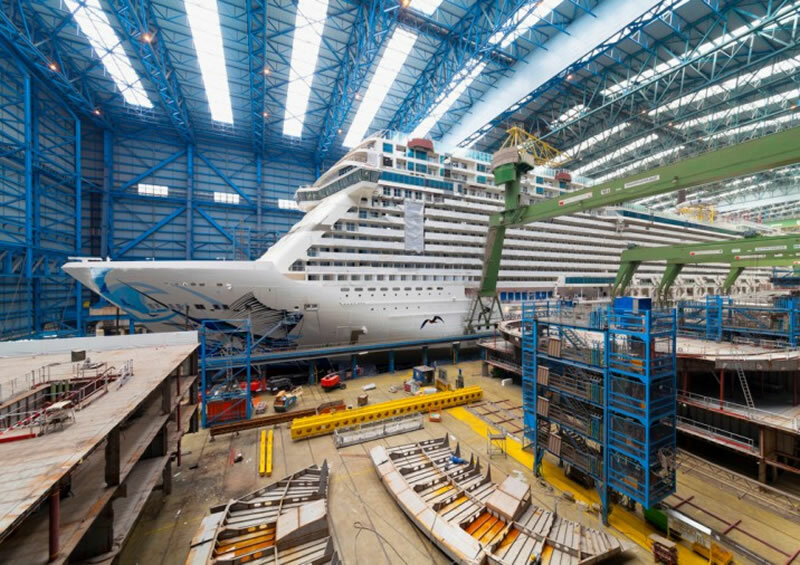 Crews at Meyer Werft in Papenburg, Germany, are preparing to float Norwegian Cruise Line’s latest ship, Norwegian Escape, out of the building shed early tomorrow morning. The float-out will also be available to watch on the official Meyer Werft webcam feeds here. The float-out from Building Dock II will be the latest milestone in the construction of the 164,600 gross ton Norwegian Escape which has taken nearly 18 months so far. Over the last few weeks crews have been conducting extensive tests and machinery trials as well as completing essential interior work to prepare the ship for leaving the building shed. Events tomorrow are planned to begin at 8.30am local time (7.30am BST) when the ship will be towed out to the harbour and berthed alongside the yard’s outfitting pier. The Meyer Werft shipyard has stressed that the timings are approximate and the float-out is weather dependant. Earlier this year the float-out of Anthem of the Seas was delayed by several hours due to poor weather conditions. Following the docking-out procedure the remaining work, tests and trials will be carried out over the following days. Within a couple of days the first crew members will move into their cabins on-board, and familiarise themselves with both the ship and its numerous systems. Norwegian Escape will then undertake a conveyance along the River Ems towards the North Sea, where she will prove her seaworthiness in her sea trials. The cruise ship spans 325.9 metres in length and 41.4 metres in width. Its construction complies with the latest safety standards and it meets all current environmental regulations. It is scheduled for delivery to Norwegian Cruise Line in mid-September 2015. Norwegian Escape‘s maiden public voyage will be from Hamburg, Germany, to Southampton departing on 25 October. A public one-night, cruise-to-nowhere sailing will depart Southampton on 27 October followed by an identical one-night private sailing. On 29 October she will bid farewell to the United Kingdom and head across the Atlantic Ocean bound for Miami, USA, where she will predominantly sail on week-long Eastern Caribbean itineraries.